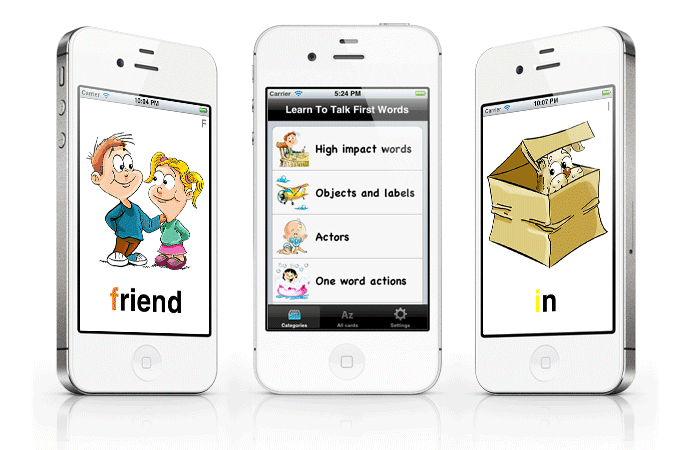 Learn to Talk: First Words is a new iPhone, iPad and iPod Touch/Itouch application that facilitates language development in one to three year-old children. As a parent you lead your child through the natural hierarchy of communicative intent, beginning with high impact words, expanding meaning by changing intonation of speech, adding vocabulary including nouns, and verbs, and then developing early syntax, simple combinations of words. The First Words deck includes early building blocks of nouns, verbs and two term combinations: action-object such as "kiss baby" or agent-action such as "daddy walk." Acquire initial exclamations or comfort words. Acquire approximately 50 object nouns. Learn approximately 10 main actors. Next develop these single word utterances by expanding intonation patters to express a variety of intents with a single word. Syntax and grammar emerge as the child begins to combine 2-3 words, and seek to expand their communicative ability.